Since it looks like I will continue going to Barrow, I went ahead and ordered a new travel laptop. My last couple of travel computers have been two different generations of the 11" Macbook Air. Fairly light at 1.09 kg. In fact, it weighs about the same as my iPad Air with the Logitech keyboard. The new 12" Macbook weighs in at 0.94 kg.or about 14% lighter and smaller in width and thickness. I had attempted to try and use just the iPad while travelling but have run into a lot of limitations. I was still able to get everything done but it just wasn't as flexible as just about any kind of computer. Here is a photo of the Macbook Air screen and below is a photo of approximately the same area of the new Macbook screen. To me, there is a significant difference in resolution and contrast and the new one is much easier on my eyes. Both have ½ TB drives and 8 GB of memory. A lot has been written in the press criticizing the choice of processors in the new Macbook. It has a 1.3 GHz Intel Core M versus my 2013 11" Macbook Air (1.7 GHz Intel Core I7). According to the benchmarks, the new Macbook is about 10% slower than my Macbook Air. I think I did notice a speed difference such as when encoding my latest PBC video. A bit slower but still acceptable for me. The other criticism is the lack of physical ports. All it has is one USB-C port and a headphone jack. The USB-C port is also used to charge the battery and to plug in anything else, Apple requires you to purchase and carry around a dongle. In my case, I picked up the one which has a standard USB port, an HDMI port and a USB-C port so you can still plug in the charger. The other criticism is with the keyboard. To make this laptop very thin, the keyboard is almost flush with the body and the keys have very little travel. To me, it's no big deal and works fine. The new "force touch" trackpad is a little harder to get used to. I occasionally press too hard. No complaints. The benefits far outweigh the shortcomings. High resolution screen, no noisy fan, 14% lighter, and smaller in just about all dimensions even though it has a larger screen. 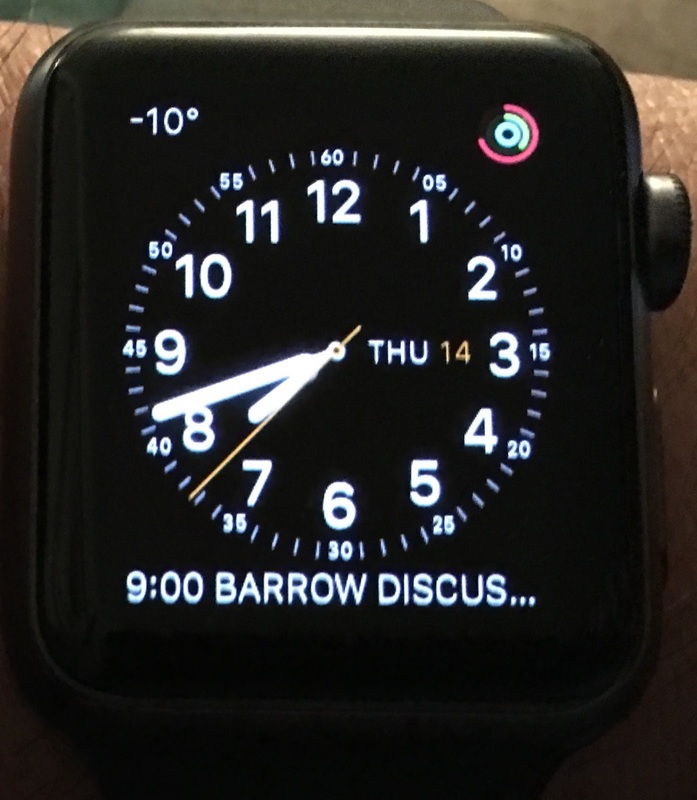 The other bit of technology that I picked up recently is an 38mm black Apple Watch Sport. I was very unsure about the "need" for this bit of tech as my analog watch kept time just fine and never needed batteries (solar powered). One of the things that made me at least consider it was that I was missing messages and phone calls from Bridget. While riding, I can't hear or feel the vibration of the phone when it's in my pocket but I can feel the tap from the watch. My winter helmet has a rubber fighter pilot style face mask which pretty much negates makes the Sena less than useful. 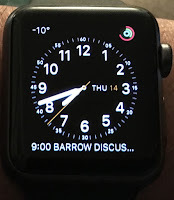 This is just one of the faces available and many give you the ability to customize things such as the inclusion of the temperature, my next appointment and the activity monitor in the upper right corner. The price still seemed a bit excessive but after watching a review on YouTube, there was an ad that said to click here for $100 off an Apple Watch. That made it more reasonable. Since I've bought into the Apple universe, other products seem less useful to me even though they may have more features. Cool gadgets. I am way too hard on wrist watches so no plans as of now to get one of these new "smart watches". I secured a cheapo wrist watch to the inside left arm portion of my riding jacket to get the time. After getting the Ural, the one thing from the BMW that I really missed was the clock. For some reason knowing the time is important to me. The new screen on the laptop looks a lot more clear/crisp. The watch looks pretty cool. I am impressed you still wear a watch, I haven't in 15 years. The difference between the two screens is amazing. And so much easier on the eyes especially noticeable when reading text. I've worn a watch for a long time. Some habits are hard to break. No watch for me, it has proven too stressful. It's even stressful to watch others watching their watch. The Macbook Air still doesn't have the new high resolution display. This is the Macbook (not Air) that was updated.